Last week we talked about color as an element of interior design. See below for more examples! Allover red makes a bold statement, accentuated by accents in black. Using a single red tone means that the walls, sectional sofa, and floor run together visually. Design by Carl Steele, as featured in Veranda. Designer Tobi Fairley's take on monochromatic color also features a single tone of lemon yellow, continued in slightly less vivid increments from the walls to the sofas and area rug. Again, accents in black and charcoal grey offset the allover color. Designer Palmer Weiss goes bold on the lacquered built-ins, but provides a bit of visual relief in the cocoa geometric carpeting. This elegant den features icy blue mixed with velvet, mirror, and crystal textures, for glamorous effect. Notice the ground effect created by the dark navy rug and slightly lighter ceiling tone. You're enveloped in color, but with a clearer sense of place than the Steele or Fairley spaces. Den by Michael S. Smith, as featured in Architectural Digest. This space takes its color cues from the abstract landscape above the sofa, but keeps the main elements of the space in a very narrow range of spring greens and icy sky blues. Touches of brown provide a grounding influence, and prevent the pastel tones from feeling overly saccharine. Design by Ashley Whittaker. Notice how the use of three fairly strong adjacent colors gives a happy, playful effect. How do you imagine this room being used--to entertain guests, or as a relaxed family space? Design by Carrier and Company. Damask and chinoiserie go modern in this vibrant bedroom by Alessandra Branca. The space could almost be monochromatic, but for accents in a watermelon tone. How would the space be different? This bedroom by Steven Gambrel takes a layered approach to color. Note the varied shades of blue, offset by sunshine yellow accents in the bookshelf and textiles. Again, this is an easy example to imagine those accents in another color. How would the room feel different with accents in navy, green, or coral? Unlike the previous spaces, this family room by Tobi Fairley uses nearly equal doses of its complementary colors, sky blue and coral. This works because the colors are of matching strength and vividness, and the background is a creamy beige. Notice that all four of the monochromatic spaces we've featured are den or study spaces. In an oddly parallel way, an allover color scheme really lends itself to a single-minded activity such as working, studying, or movie watching. It goes without saying that you'll want to select your color wisely, but we're saying it anyway. This is a situation where a little research into color psychology would be very wise. Also worth noting is that monochromatic interiors rarely use a true hue, but rather a shade softened by a little bit of grey or brown. Analogous palettes make their selections from adjacent colors on the wheel, which tends to make things easy on the eyes. Still, these can be serene, as in the living room by Ashley Whittaker, or bold, as in the family room by Carrier and Company. Have a color question? Stop by the showroom at 42 Nguyen Dang Giai, Thao Dien for some advice, or fill out the form below to set up a consultation. COLOR IS A GREAT PLACE to start in exploring your personal design tastes, because our reactions to it tend to be instinctual and very personal. Start by letting go of any preconceived ideas about color. Forget what you may have read about what's trendy in fashion or interiors and really pay attention to what you're naturally drawn to. Does that red wall make you feel energized or claustrophobic? When browsing in a clothing boutique, do you gravitate towards saturated, vivid colors or more subtle tones mixed with gray or black? How about nature: Is it a periwinkle blue sky that makes you feel at ease, or sunny yellow blossoms on a tree near your home? Living Room by Gary Riggs. Let's say that green evokes a response you'd like to bring into your home. Now, how to use it? Here's where you need to have some idea of the kind of energy and atmosphere you want to create in your space. Marc Chagall tells us that "all colors are the friends of their neighbors and the lovers of their opposites." Each has their benefit, of course--passion at its best is exciting and energizing, but messy when it goes wrong. Friendship should be uplifting, comfortable and relaxed. If it's drama you're after, you'll want to focus on colors that are opposite to one another on the wheel, known as complementary. For green, that's red. Are you thinking Christmas yet? Pure red and green would easily head in that direction, but when we select variations on the hue, the result is more nuanced and sophisticated. In the living room at left, the color scheme follows from the large abstract hung above the sofa. A vibrant red was an easy choice with the painting, but can you imagine the room with something else in place of the green? There are warm yellows, bold blues and deep reddish-browns. The light, fresh, spring green chosen by the designer relates to subtle yellow-green tones in the painting, but gives the room a completely different feel. Less obvious usually equates to more interesting. Using tones adjacent to one another on the color wheel creates an analogous color palette. It's calming for your eyes, and tends to be easier to get right. Friendship doesn't have to mean boredom, however. The Jean-Louis Deniot bedroom pictured below is a great example of this. Warm yellow and beige tones mix with icy greens and touches of turquoise. The color is most vibrant on the drapery, skirted table and trim on pillows, but your eyes don't have to work hard to connect it all. Another part of what works in this example is the way the color varies. For a more interesting palette, you'll need to think beyond the pure colors (called hues) that we learn as children. A hue mixed with white creates a tint, gray for a tone and black for a shade. Imagine a room done completely in pastels. You may love the colors individually, but together they'll look young and overly saccharine. Using all shades can result in a dull space. Together, however, the contrast between them will make both more compelling--lights look lighter and darks look darker. The most interesting and layered spaces will use a mix of hues, tints, tones and shades. Living Room by Michelle Nussbaumer. You might think that the easiest color palette to develop in your space would be monochromatic, but that isn't necessarily true. Your color variations need to be chosen carefully in order to get the look you want. Too similar but not identical, and they may clash; too dissimilar, and they won't connect. The phrase "same same, but different" comes to mind here. Monochromatic doesn't have to mean safe or simple either. In the Michelle Nussbaumer living room at left, do you notice the way the use of color draws your eyes upwards? Beginning with the black and white floor, you naturally work up from the emerald sofa to the medium-toned screen, the lighter yellow-green on the walls, and finally the white chandelier. There's a lot more happening in this space to make it work, but you can see that color plays a large part. A monochromatic palette actually allowed the designer to be bolder and more playful in other elements of the space, such as pattern and texture. This article was originally written for Oi Vietnam, and published in August 2014. You can find the entire issue here. There could be no better follow-up to last week's post on Modernist Glamour than today's home tour, an impossibly glamorous apartment fit (literally) for royalty--in this case, a Middle Eastern princess making her first home in the city. Designer Jean-Louis Deniot renovated the nearly 500 square meter home for the first time since the 19th century building was completed. In the living room pictured below, a design of concentric arcs and straight lines graces both the ceiling and floor, a favorite trick of the designer also seen in his Chicago project. The shapes are echoed again in a pair of half-moon sofas, modern klismos occasional chairs, and sconces. Deniot balances the dynamic impact of all those circular shapes with an underlying symmetrical layout, which keeps the room from spinning. Design by Jean-Louis Deniot, as featured in Elle Decor. Photography by Simon Upton. The apartment's other spaces are equally self-referential. In the breakfast room, below left, lines of a sputnik-esque crystal light fixture are echoed by the table base, on the backdrop of hand-painted walls that recall quartz. A more subtle approach is taken with a tonal geometric pattern on the walls of the study, which in picks up on the brass desk's faceted form. Even the lines of the coffee table seem to run into the pattern of the carpeting. This kind of overload in pattern and texture really only works because of the flat's limited color palette of dreamy blue-greens and layered neutrals. If you can imagine the same apartment, but with a varied color scheme in each room, it would be positively overwhelming. Speaking of overload, the media room pictured below really pushes the envelope--but it works. Although nearly every surface is patterned, most of the ornamentation appears in low-contrast color tones, which is what saves the space. Would you live here? How about if the walls were a solid white or cream instead of the horizontal stripe? We'll finish with the master suite, because it's just plain beautiful. This is the only other space in the apartment featuring that dreamy blue-green tone from the living room, but it appears here as a richer, deeper version. The custom canopy is undeniably grand, but the bed itself is a rather low, contemporary number, and the bedside tables are petite as well. That kind of contrast keeps things modern, and makes this a room for living in rather than merely looking at. 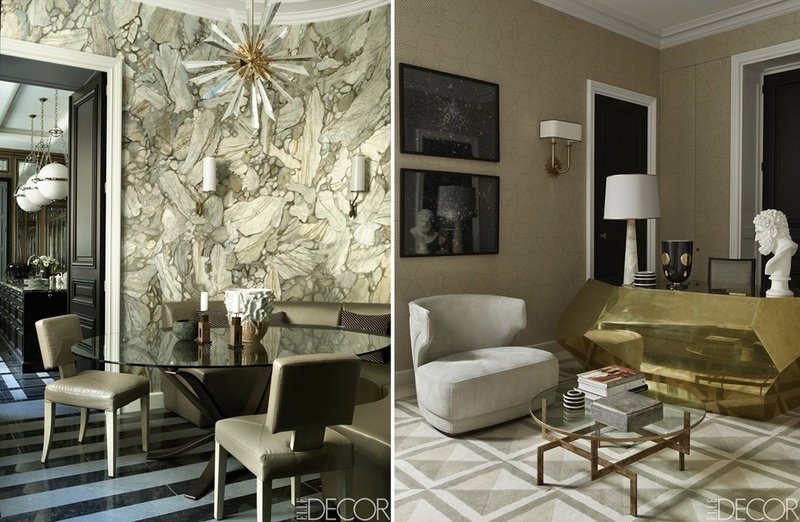 For more of this space, visit the original article as posted by Elle Decor here. For more by designer Jean-Louis Deniot, check out his portfolio here. This post is part of a series highlighting the design styles we feature on our Pinterest. Follow along as we explore these styles, and learn how you can apply them to your own home! It may be January, but we aren't quite ready to say goodbye to the glitz and glamour of December's holidays. This month we're looking at Modernist Glamour style. The modernist movement of the 19th and 20th centuries rejected the use of purely decorative motifs in art and interiors, preferring an emphasis on the material itself, as well as form. While we're using the term "modernist" loosely, the rooms in this collection definitely favor form and shape over pattern and surface decoration. The interior architecture of the living room below includes quite a bit of detail, but repetition of the rectangular shape throughout the space keeps it graphic and bold rather than classic and staid. Notice how the designer even carried the detail to the area rug and quadruple cocktail tables. Living room by Pablo Paniagua. The pedestal table base in this dining room by Achille Salvagni echoes classic shapes, but in a silhouetted manner that is decidedly modern. 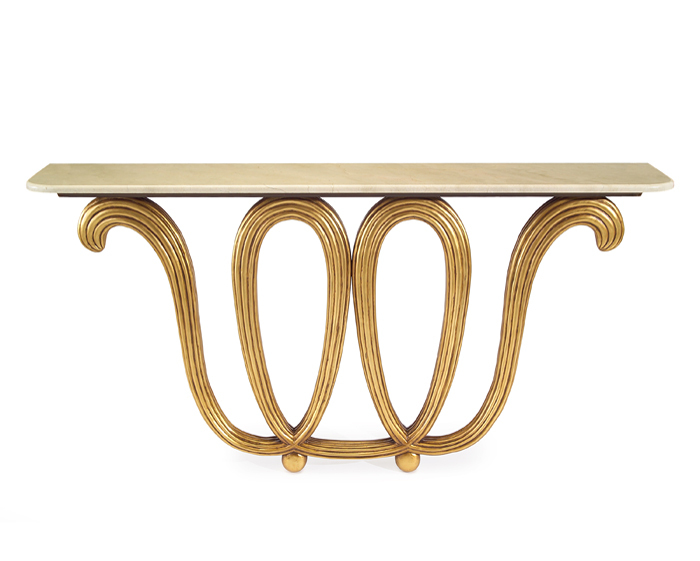 Brass detailing on the edges accentuates the effect. Dining Room by Achille Salvagni, as featured in Elle Decor. Bedroom by Jackie Astier as featured in Elle Decor. But if we're boiling it down, a Modernist Glamour space really has to include velvet. Lustrous, rich, and deliciously tactile, this material really brings the glam. Living Room by Frank Roop. Living Room by David Collins Studio.